In this step, since you will be writing a server function, you will write the XML to receive the request for the department description. You can use any text editor to write XML. 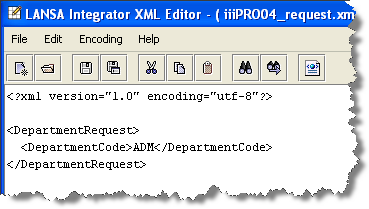 In this case, you will use the XML Editor which is part of Integrator Studio. Important Note: The <?xml version="1.0" encoding="UTF-8"?> statement must be the first line in the document. There should be no blank lines or characters before it, or an error will occur. 2. You must provide the department code in order to obtain the department description from the server, You will need a root tag enclosing a tag for the department code. Call the root tag DepartmentRequest and the department code tag DepartmentCode. Include a sample value of the information sent in the DepartmentCode tag, for example ADM.
3. Save the XML and select Yes in the Confirm dialog. The file was created when the editor opened. Close the XML File Editor. 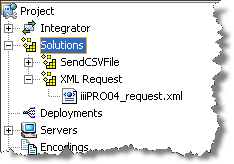 Notice that the XML file you have just created now appears in Integrator Studio under your XML Request solution group.